ORLANDO, FL--(Marketwired - October 15, 2013) - Southwest Airlines Vacations is offering travelers $100 in savings when booking Nassau Paradise Island vacation packages. Plus, travelers can enjoy additional instant savings of up to $250 on stays of four nights or more and up to 65 percent off select hotels. Slow down and take in the sights, sea, and sand of Nassau Paradise Island with an exciting vacation package to the Bahamas. Relax on the beach, reel in some deep-sea fish, enjoy a snorkeling adventure, and take in everything that this island paradise has to offer. Travelers who book a flight and hotel vacation package to Nassau Paradise Island with Southwest Vacations for four nights or more will save $100 when using the promotion code OCTNAS100 at the time of booking. Plus, guests can save even more with up to $250 in instant savings and additional hotel discounts. 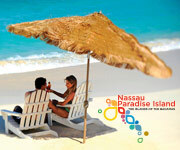 To take advantage of this Nassau Paradise Island vacation deal, travelers must book their packages between October 8, 2013 and October 21, 2013 by 6:00 p.m. Central Time for travel October 9, 2013 through April 4, 2014. One-day advance purchase is required. Blackout dates and restrictions may apply. Customized vacation packages include roundtrip flight via AirTran® Airways and hotel accommodations (including taxes). Plus, first and second checked Bags Fly Free® -- savings of up to $120 per person, roundtrip. † Even Golf Bags Fly Free®. Visit the Benefits of Booking a Southwest Vacation page to learn more about everything included in a customized vacation package. About Southwest Airlines Vacations -- Southwest Airlines Vacations offers vacation packages to over 95 destinations with flight service available from every scheduled Southwest Airlines departure city. Additionally, we offer vacation packages to Mexico & The Caribbean from most Southwest and AirTran departure cities, with flight service operated by AirTran® Airways. Travelers can customize vacation packages to include flight, hotel, car rentals, show tickets, attraction passes, tours, and more. Southwest Airlines Vacations is located in Orlando and operated by The Mark Travel Corporation (TMTC). TMTC is a member of the USTOA $1 Million Traveler's Assistance Program and ASTA TOP. For more information on Southwest Airlines Vacations, please visit: http://www.southwestvacations.com. $100 promotion code savings apply on flight plus hotel vacation packages to Nassau Paradise Island of four nights or more. Savings is reflected in the package price when using promotion code OCTNAS100 at the time of booking. Length of stay for flight and hotel components must match. Promotion code intended for redemption by individual consumer only. Savings valid if booked October 8, 2013 through October 21, 2013 by 6:00 p.m. CT for travel October 9, 2013 through April 6, 2014. Up to $100 promotion code savings are not valid at Riu Hotels and Resorts or Breeezes Resorts. Up to $250 instant credit savings is not valid for travel November 27, 2013 through November 30, 2013 and December 26, 2013 through January 1, 2014. Instant credit savings is included in package price. Instant savings offer is valid with a minimum of double occupancy per room. Additional hotel savings vary by participating venue and are combinable with the above mentioned up to $350 savings. Seats are limited and may not be available on some flights that operate during peak travel times and holiday periods. Flight and hotel rates may vary by day of week. Surcharges may apply to weekends, holidays, and convention periods. Flights available on published, scheduled service only. Rates may be subject to change until purchased. All Rapid Rewards® rules and regulations apply. Discounts are valid per reservation before taxes are applied. Offer not valid on existing reservations and may not be combined with any other offer. Subject to availability. Restrictions apply. The Mark Travel Corporation is the tour operator for Southwest Airlines Vacations.